It's Friday, so let's bring your productivity to a screeching halt with Help I Need Help. Along with pharmaceutical remedies in innovative packaging, they also provide hilarious help for your non-physical ailments. Last week I mentioned the site on Twitter, and the kind folks of @HelpRemedies immediately asked whether I suffered from any maladies they hadn't already addressed. I fear confrontation, I truthfully replied. So they created this exercise to fix me. The more you click, the harder you'll laugh. I'm now happy to report that I no longer dread run-ins with animated, shirtless men. You have read this article time-wasters with the title October 2010. You can bookmark this page URL http://jenkrebs.blogspot.com/2010/10/help-for-whatever-ails-you.html. Thanks! 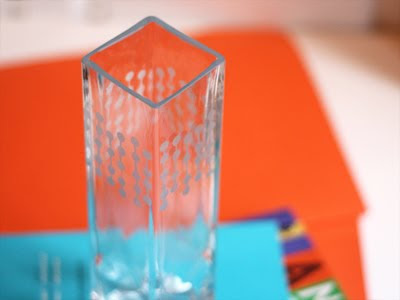 An easy glass etching project on a cheap vase from IKEA. On a piece of self-adhesive contact paper, punch holes in columns. 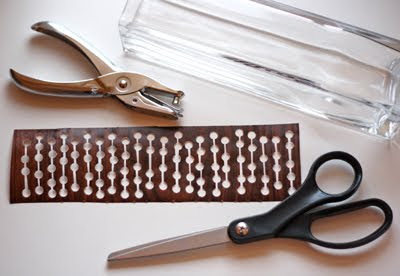 Then with a scissors, cut out little lines to connect them. 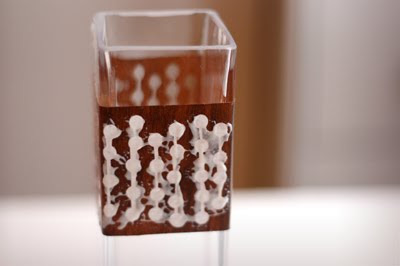 Pull the backing off the contact paper and stick the design to the vase. (No transfer paper needed for this one, unlike my other ill-fated project.) Then glop on some glass etching cream. I used Armour Etch, available at most craft stores. Let the vase sit for the time recommended on the bottle, about 5 minutes. Then rinse off the cream and remove the stencil. Your vase will now be fancy. You have read this article tutorials with the title October 2010. 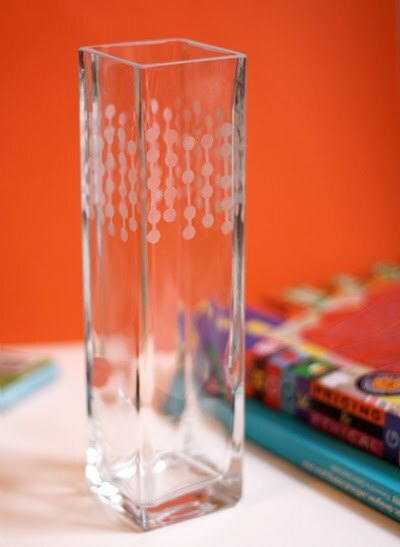 You can bookmark this page URL http://jenkrebs.blogspot.com/2010/10/glass-etching-with-punched-pattern.html. Thanks! Hey, there's my fabric at Target on a slipper chair! A fun surprise. You have read this article design work with the title October 2010. You can bookmark this page URL http://jenkrebs.blogspot.com/2010/10/fabric-sighting-at-target.html. Thanks! The League of Moveable Type has made League Script #1 available as a free download. I think my early cursive penmanship looked very much like this before it all went to pot. You have read this article downloads / fonts with the title October 2010. You can bookmark this page URL http://jenkrebs.blogspot.com/2010/10/free-font-league-script-1.html. Thanks! Real Simple offers this quiz to determine what your color choices say about you. Unfortunately I ended up a "water personality" who is supposed to decorate with blue because I am "steadfast and sympathetic." Crud. Guess I should aim for flighty and insensitive next time. You have read this article quizzes / time-wasters with the title October 2010. You can bookmark this page URL http://jenkrebs.blogspot.com/2010/10/quiz-find-your-color-personality.html. Thanks! What are you doing this weekend? Cleaning your bathroom? You'd better cancel those plans and try one of these tutorials for making something pretty with fabric. Apron tutorial by the ladies of Ink & Spindle, featured on The Crafts Dept. You have read this article bag / fabric / sewing / tutorials with the title October 2010. 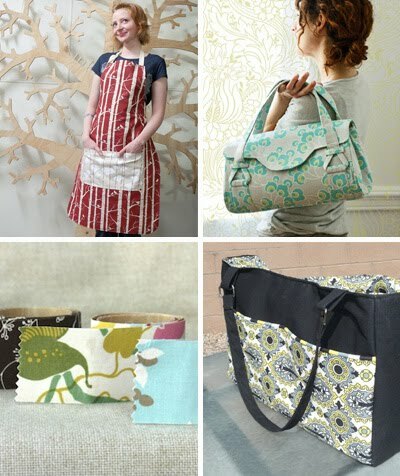 You can bookmark this page URL http://jenkrebs.blogspot.com/2010/10/bag-apron-and-tape-tutorials.html. Thanks! Still experimenting with my Silhouette digital cutter, I tried out some heat transfer material that came with the machine. The result is this tote. I cut my own design from Adobe Illustrator, which went beautifully. When it came to ironing the pieces onto the bag, I had a little trouble. Though you can't see it in the photo, some little bits of the black shapes aren't quite stuck down all the way on the tote. Maybe I can go back and fix that somehow, but I'm not optimistic. It was a big struggle to get them to adhere to such coarse canvas, so I'd recommend ironing this stuff onto something smoother. I had a wrestling match with my iron and the tote bag. We had to roll around on the ground in a fist fight with some sweating and cursing, but I won. Mostly. You have read this article with the title October 2010. 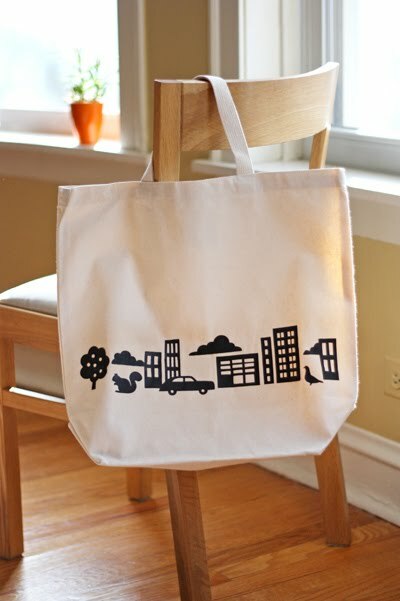 You can bookmark this page URL http://jenkrebs.blogspot.com/2010/10/diy-heat-transfer-tote.html. Thanks! 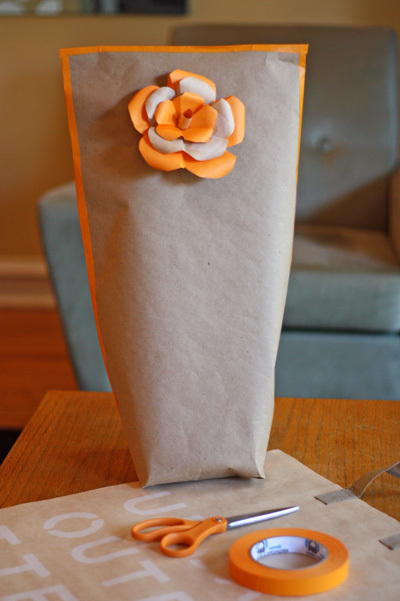 Awhile back I prepared a little guest post for Whip Up with a collection of delectable office and craft supplies. I see it's up today, so click over there if any of these goodies look like something you can't live without. You have read this article favorite things with the title October 2010. 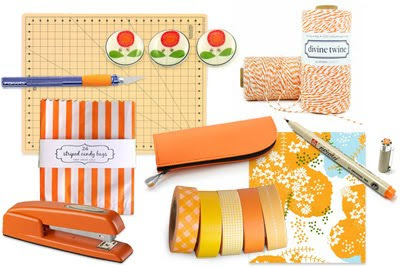 You can bookmark this page URL http://jenkrebs.blogspot.com/2010/10/nifty-orange-craft-supplies.html. Thanks! My weekend included an afternoon of screen printing with The Needle Shop's Rachel Epperson and friends. 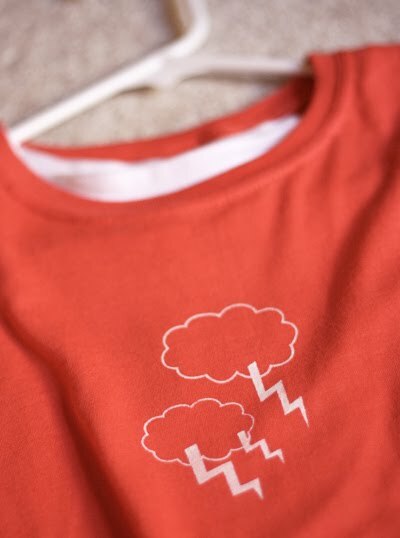 Check out my lightning bolt t-shirt, one of Krissy Callahan's designs. Shazam! Krissy is the kind, fun, and very patient screen printing teacher at the shop who helped us create our masterpieces. I highly recommend taking the screen printing class over there; you can make loads of things in just a few hours. Do up totes and scarves and stacks of t-shirts... Presents for everyone you know! Including yourself. You have read this article with the title October 2010. You can bookmark this page URL http://jenkrebs.blogspot.com/2010/10/i-screen-printed.html. Thanks! Note to self: when wrapping a gift with a weird shape, it doesn't matter how strange the package looks. Slap a flower on it and people will like it. 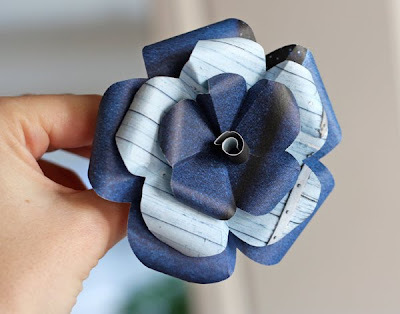 Paper flower tutorial here. You have read this article paper / random / recycled with the title October 2010. 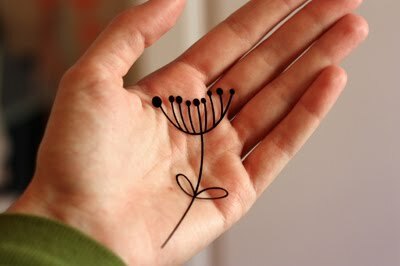 You can bookmark this page URL http://jenkrebs.blogspot.com/2010/10/a-flower-makes-everything-better.html. Thanks! A little graphic designerly eye candy for Friday: Judy alerted me to these Pantone folding chairs designed by Selab Studio for Seletti, just one more item in Pantone's ever-expanding product line. (Available at many retailers, including Heliotrope or Broadway Paper.) I love them dearly! Just one question: where's the orange? You have read this article shop with the title October 2010. 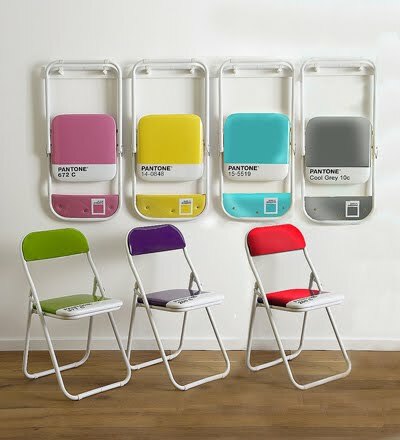 You can bookmark this page URL http://jenkrebs.blogspot.com/2010/10/pantone-branded-folding-chairs.html. Thanks! Kill a few minutes before lunch at Typewar by identifying the typeface for any given letter. If you know your fonts, you might get bored quickly since the two choices often look nothing alike and only a few typefaces are represented. Then again, an L in Helvetica Neue and Verdana look mighty similar... As you continue to advance through the levels, more fonts are unlocked. You have read this article fonts / time-wasters with the title October 2010. You can bookmark this page URL http://jenkrebs.blogspot.com/2010/10/typewar-font-game.html. Thanks! You have read this article desktops / downloads with the title October 2010. 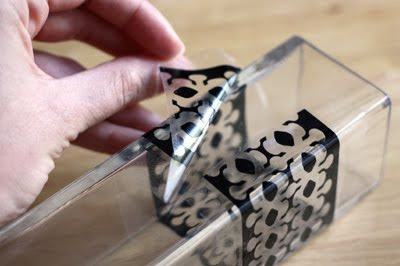 You can bookmark this page URL http://jenkrebs.blogspot.com/2010/10/patterned-desktops-and-printables-from.html. Thanks! 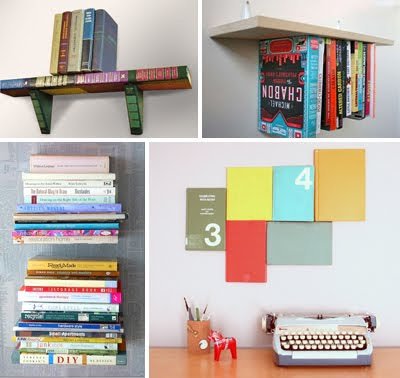 If you need a cheap decorating idea that will make you look smarter, check out these tutorials using books as wall art. You probably have a million books sitting around already. If not, hit up your nearest garage sale, rescue some from a dumpster, or take some from the stacks on the floor at my house. You have read this article decorating / tutorials with the title October 2010. 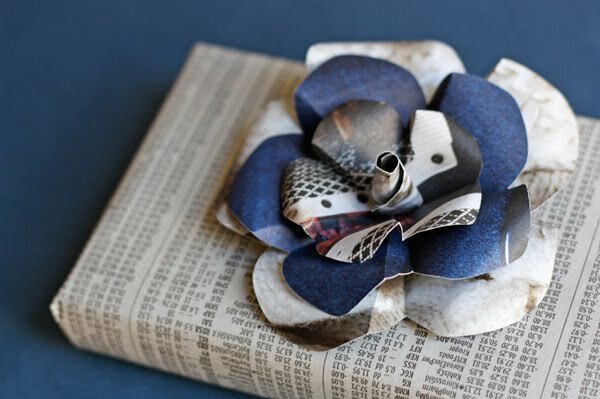 You can bookmark this page URL http://jenkrebs.blogspot.com/2010/10/diy-decorating-with-books.html. Thanks! TinEye is a reverse image search engine. Submit a picture, and TinEye will tell you where it's being used on the web. This could be very handy when you've saved an inspiring photo and can't remember where you found it. I tested it by searching for this photo of mine and found it on 24 sites. Interesting! You have read this article resources with the title October 2010. You can bookmark this page URL http://jenkrebs.blogspot.com/2010/10/reverse-image-search-with-tineye.html. Thanks! My latest test with the Silhouette machine involved fabric. I ironed Heat'n Bond to the back of some thin cotton, held my breath, and ran it through the cutter. There were a couple places, mostly in corners, where the blade didn't quite cut all the way through, but it was easy to touch them up with a scissors. Then I ironed the shape onto a onesie. The machine will only cut through very light-weight fabrics, I think, and you'll likely need to apply some kind of backing or stiffener to them. I ironed more fabric onto cardstock to make a matching notecard. The card had to be cut with a scissors since the Silhouette felt unhappy about slicing through fabric and cardstock together. That's okay. I don't want to be too demanding. 11/9/2010 Update: Just got this from the folks at Silhouette support: "Attempts to cut thicker materials or certain materials the Silhouette is not designed to cut that are more dense (such as shrink plastic, foam, chipboard) or fibrous in nature (such as fabric) may ruin the blade or result in the blade dulling very quickly." Um, okay. Sorry little blade. I won't cut fabric anymore. 1/31/2011 Update: Silhouette support now states it is possible to cut fabric using their new interfacing options. See here for more information. You have read this article fabric with the title October 2010. You can bookmark this page URL http://jenkrebs.blogspot.com/2010/10/making-fabric-iron-ons.html. Thanks! If you'd like to download the PDF templates, get the large flower here and the small flower here. You have read this article paper / recycled / tutorials with the title October 2010. 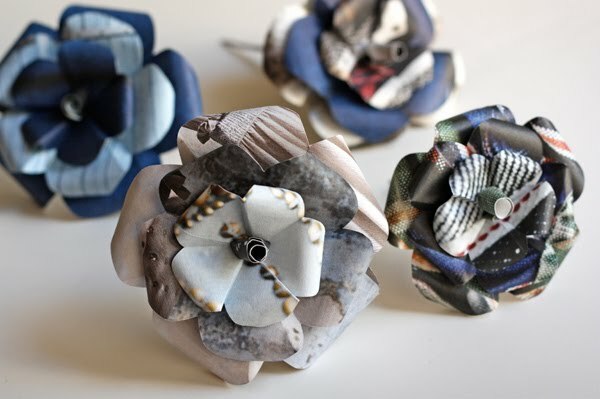 You can bookmark this page URL http://jenkrebs.blogspot.com/2010/10/how-to-make-recycled-paper-flowers.html. Thanks! One project I wanted to try with the Silhouette cutter was glass etching. I cut this design (Bone Stitch Border C00225_19547) on vinyl, then stuck the inner piece to this white vase to spice it up. Couldn't let that shape go to waste. 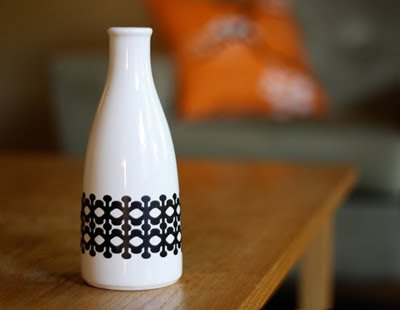 My real intention for the vinyl was to apply the leftover outline to a glass vase, paint in the spaces with etching cream, and peel off the vinyl to reveal the cool design on the vase. Cutting the vinyl went just fine, but then I hit a snag. 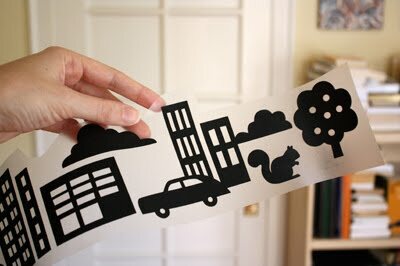 Silhouette offers transfer paper intended to hold all your vinyl pieces in place while you position them. The idea is to stick it to the top side of the vinyl, then pull the backing off the vinyl. 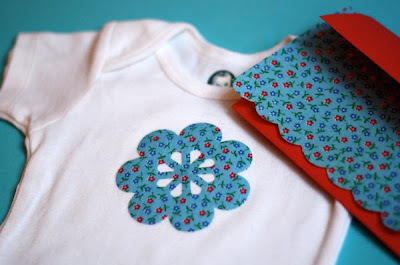 Adhere the design to your surface and pull the transfer paper off the front. All the vinyl pieces should remain attached to your surface. Only they came up with the paper instead of sticking to the glass. My plans were foiled! Experienced transfer paper users, is there something I'm not understanding? You have read this article with the title October 2010. You can bookmark this page URL http://jenkrebs.blogspot.com/2010/10/playing-with-vinyl-decals.html. Thanks! At Invys.com, you can choose a stationery design and change the colors and fonts online to make it your own. The site is extremely easy to use—I tried it out—and you can download your files to print at home or have them printed for you. They offer a few free designs to try. Get an invitation set with pretty flourishes right here, or check out their Christmas and holiday cards right here. You have read this article entertaining / printable with the title October 2010. 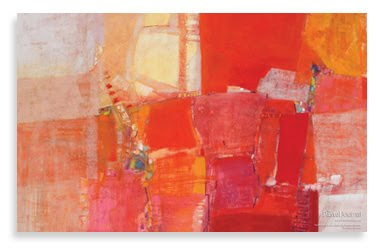 You can bookmark this page URL http://jenkrebs.blogspot.com/2010/10/free-customizable-invitation-sets-for.html. Thanks! Quiz: What's your color personality? Better Homes and Gardens offers this quiz to help you decide what color to paint your walls based on your answers to eight questions. Apparently my color personality is green. Green? Though the description wasn't far off, this is still very disappointing. I bet it's because I chose to read memoirs of famous figures instead of romance novels about passionate encounters. You have read this article decorating / quizzes / time-wasters with the title October 2010. 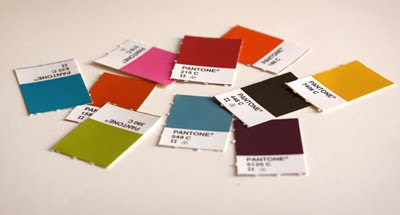 You can bookmark this page URL http://jenkrebs.blogspot.com/2010/10/quiz-what-your-color-personality.html. Thanks! You have read this article desktops / downloads with the title October 2010. You can bookmark this page URL http://jenkrebs.blogspot.com/2010/10/orangify-your-computer.html. Thanks! I've never been terribly excited about owning a digital cutter, thinking my trusty fingers and low tech X-acto knife can handle most jobs. 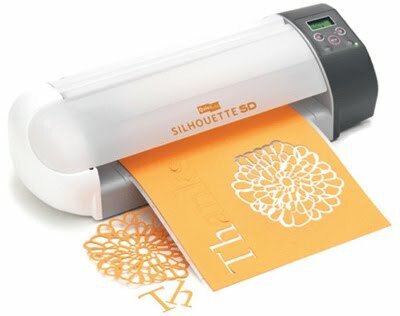 But recently I received a Silhouette digital cutter to test and review. I'm afraid my poor old X-acto knives are going to feel neglected, because this thing is great. And you can win your own! Read on. The Silhouette is a cute little number that's smaller than a printer, with a power cord and a USB cable that connects to your Mac or PC. After some confusion, I finally realized the accompanying instruction book is for old Windows software that doesn't look anything like the new Mac Silhouette Studio software I downloaded. Once I ignored the instruction book and referred to the Users Manual in the Help section of the new software, I was off and running. It's actually really easy to use, despite my first impression. Now that I've got the hang of it, I'm super excited. 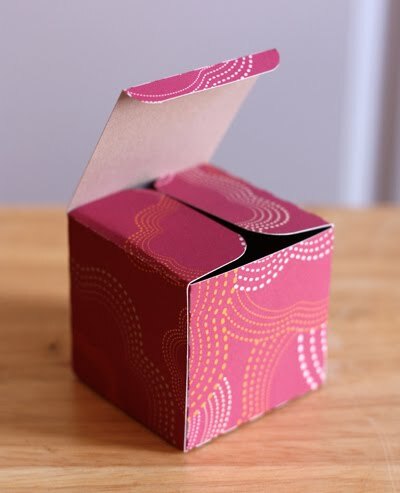 The machine comes with 50 free shapes to cut, or you can choose from hundreds of other options available for 99 cents: boxes, cupcake wrappers, doilies, and more. Shapes are scalable and easy to modify. Or create your own shapes with the software, which works like a pared-down version of Adobe Illustrator. Or actually create your shapes in Illustrator and send them to the Silhouette. 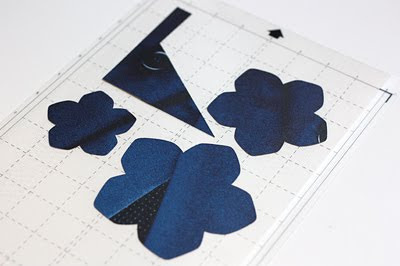 It will cut text-weight paper, card stock, adhesive vinyl, magnet or tattoo paper, and heat transfer material. My first project was a little box. I pushed a button and the entire template was cut out in less than 30 seconds while I stood by and drank coffee. And of course it's perfect. 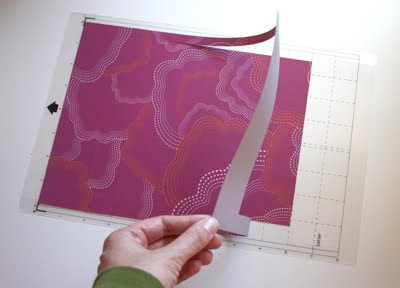 Then I forced it to cut something tiny and delicate from self-adhesive vinyl, just to see if it would explode. Also perfect. Dang. I'm not doing that with my X-acto knife. For lots of project ideas, see here. As I try other things, I'll let you know how it goes. Want to win your own cutter? One lucky commenter will win a Silhouette machine (a $299.99 value) with everything you'll need to make it go: Software for Windows XP/Vista or Mac, a power cable, USB cable, 2 cutting mats (one for thick media, one for thin media), one cutting blade, and a $10 gift card to the Silhouette online store. Leave a comment on this post by Monday, October 11 at midnight CDT. Open to US residents only; sorry! The company doesn't ship internationally. Silhouette winners from other giveaways are not eligible. Be sure to include a link or other way to contact you. The winner will be contacted and announced in this post on October 12. Update: Giveaway is now closed. Commenter 1469, Kel O., was randomly selected and has been given the good news! You have read this article giveaway with the title October 2010. 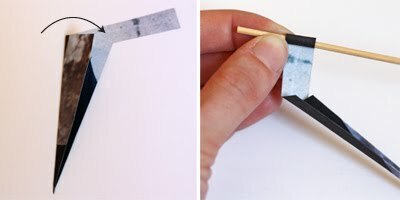 You can bookmark this page URL http://jenkrebs.blogspot.com/2010/10/giveaway-silhouette-digital-cutting-tool.html. Thanks!